I love to try a variety of salad dressing recipes. Although the traditional oil and vinegar vinaigrette recipe is my all time favorite, it is amazing how easy it is to switch it up by using different vinegars, juices, oils and herbs. One or two different ingredients can really make a difference to the taste. 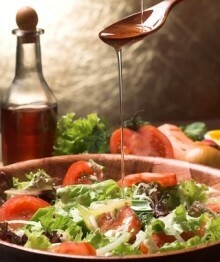 Here and there I have included ideas for the foods some of these salad dressing recipes will suit best. Try them out and see what works best for you. Dissolve the salt in the vinegar. Add the oil and pepper and whisk or shake to combine. Pour over salad just before serving. Combine vinegar, garlic, oregano and rosemary. Blend in olive oil slowly. Combine the two vinegars with the sea salt and blend. Add the olive oil and shake together or whisk in gradually. Add mustard and honey to vinegar and mix. Mix in olive oil. Great with grilled steak or salmon. These salad dressing recipes are all very healthy for us. Don’t be afraid of a little bit of oil. Good quality olive oil is extremely good for us, and the herbs and spices you add to some of the salad dressings are very nutrient dense too. Even vinegar has it’s health benefits. Making your own salad dressings and vinaigrettes is so much better for you than buying salad dressings in a bottle. The dressing is fresh, you know the ingredients that are in it – as well as all of the preservatives that are left out of your delicious homemade salad dressing recipes. We have so many variations on vinaigrette salad dressing recipes that they extend over several pages. Some of the recipes on the next page are more gourmet, although there is also a delicious garlic vinaigrette there too that is great for every day. Try them all and treat yourself to a new salad experience every day! Find more delicious salad dressing recipes here.